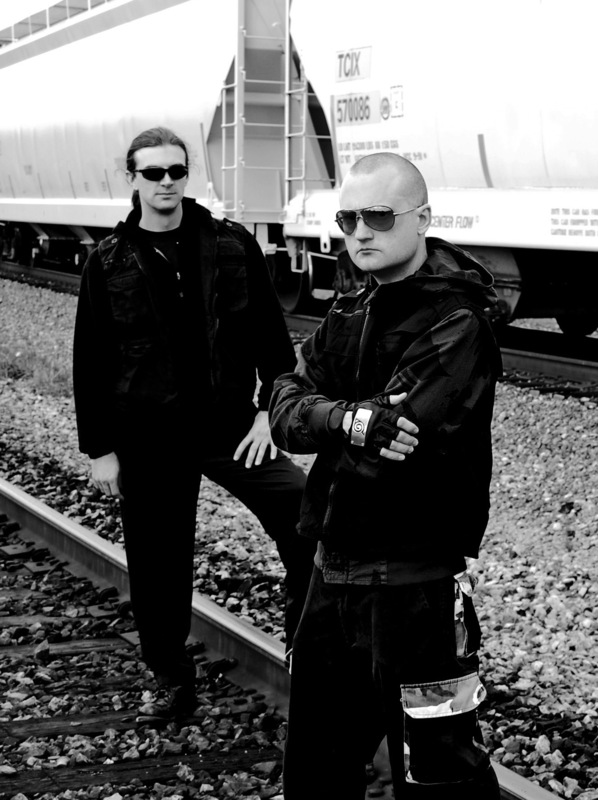 Since 1999, Asmodeus X has been storming the base with their unique sound. Based in Houston, Texas, Paul Fredric and Marshall (originally members of 90's Goth band, Morphine Angel) set out to uncover new musical directions with a project that fuses electronic beats and metaphysical themes,-a hybrid of ancient dreams and esoteric thoughts, combined with futuristic and post-modern soundscapes. Asmodeus X draws inspiration from many influential styles of music, including those that span the gamut from old-school Goth, euphoric Trance, Experimental Noise and Electronic Body Music, to popularized labels such as 'Futurepop', along with Kraftwerk-esque and Industrial influences that could best be described as "DBM": --Daemonic Body Music. Early performances earned Asmodeus X a Houston Press Critic's Choice Award for "Best New Industrial Act", and in the millennial year, 2000, allowed for further crystallization of their sound through live performances including The Annual Houston Vampire Ball at Numbers Nightclub, along with a plethora of live shows throughout Texas with such acts as Snog, My Life With The Thrill Kill Kult, Attrition, Diva Destruction, Psyclon 9,The Last Dance, Cesium 137, Sunshine Blind, The Cruxshadows, Seraphim Shock, The Machine in The Garden, Nocturne, Ctrl, Bamboo Crisis and Chant to name a few. The "Asmodeian sound" is an eclectic one. From their neo-classical/minimalist beginnings with the instrumental "Cult of the Nassarene E.P. ", to Fritz Lang- Theremin-laced symphonics apparent on the early "Nova Futura" singles, they have traversed styles while always maintaining an undeniable essential quality; that is immediately recognizable, darkly compelling, hypnotic, inspiring and reflective. 2002 marked the debut of the power-driven and 'survivalist' themed album "Wolf Age", an album that is at once epic as it is controversial. The usage of minimalist synths and guitar-driven tracks along with Theremin instrumentations, viking horns and neo-folk, rock-stylings, formed a heavy homage to frozen Norse Lands and images of Babylon --an ongoing acknowledgement of Man's eternal "existential" struggle with himself. Additionally, the album delved deep into the urban technocracy of future worlds yet to be imagined, -a testament to the trying times of a 'sleeping' society, and an offering of hope through the strangled cry of self-liberation. As Wolf Age undeniably championed these themes, it was also symbolic of the trials and tribulations of that year, where former guitarist Frank G. Lesikar passed away soon after, and the alchemical combinations of Asmo's sound were splintered, resulting in a total re-configuration and new direction for the band. The introduction of percussionist, Joel313, marked an "illustrious new dawn" for Asmodeus X in the summer of 2003. The re-created 3 piece were now unified in a powerful combination of synthesized soundscapes and vocoder-effects, drawing heavily on a rich tapestry of EBM and trance influences, yet never surrendering the recognizable essence, that at once has become known as "The Asmodeian sound". With these fruitful beginnings, the band released a 2nd album through independent label Latex Records (based in Atlanta), and currently are working on their 3rd album "Sanctuary", to be released through Kreislauf Records in 2006. "Lucifer Morningstar: The first among equals and the bearer of light. The Promethean story of a fall from grace, a struggle for identity, and the emergence of self-aware being. For this effort Asmodeus X is delving deep into the spheres of ebm, darkwave, and trance. A wholly synthetic effort drawing on analogue, digital and vintage synths, electronic percussion, vocoders, etc., Morningstar seeks to explore the seductively forbidden side of the human psyche - that which empowers us to create the very process of creation. " An album at once unique and striking, Morningstar has become critically acclaimed in its complex orchestrations of thoughtful lyrics and hypnotic beats. After nearly three years in the studio, Asmodeus X released their third album: Sanctuary in the fall of 2007. Through this process, many allies from were called to collaborate and many elements from past works were resurrected. Sanctuary journeys into the cosmic realms of dark techno and trance inspired EBM, with great tracks like Glass Towers, Caves of Steel, and Alxemist, and garnered much club play in the Northern European markets. The song Darker Shores was written about in the book, Strange Sound of Cthulhu: Music Inspired by the writings of H.P. Lovecraft, by Gary Hill of Music Street Journal. The track was actually a reworking of early material and features guitar work from departed Asmodeian Frank Faust. The track On a Spaceship with Beelzebub was originally written for the Cult of the Naassarene, and features guest guitar work by former Morphine Angel guitarist Deros Mezmeronicus. Microcosm includes a spoken-word guest appearance by fellow daemon Typhon Vortex. Kriegsmaschinen includes German translation by Opus of Stark Adder. With themes of space migration, machine revolt, and desert combat, Sanctuary takes the listener on a tour of the chaotic madness of our modern-day world, and then directs our attention to the worlds beyond and a place of rest, a place of safety. The rush of Sanctuary brought many new live performance opportunities, including a show on the Goth Cruise ship in the Bahamas. And in 2009 they won best album, best E.P., and best Live Performance by the Revolutions Music Awards (Gulf Coast Electronic Music Association). The momentum of Sanctuary also attracted local guitar celebrity Chris Vasquez to pick up a keyboard and begin contributing to the caldron. Vasquez brought fresh perspectives to the project, and the Asmodeian sound continues to evolve as they continue working toward their fourth release. Thematically, Asmodeus X continues to court the far-out trenches of time and space, deepening their own evolution and development as a band, continuously pushing the boundaries of our social fabric, with intelligence and tenacity. Refusing to subscribe to popularized expectations of specific genres of music, Asmodeus X continues to execute songs that have always been simply described as, "Asmodeus X". "It's not what you have, it's how you use it", could be a valuable lesson learned when one experiences their sound, and as the creative flow continues to evolve, so the journey continues, for Asmodeus X.